Leaves are composed of three principal tissue systems: epidermis, mesophyll, and vascular tissue, but the organization and extent of each of these systems are almost as variable as leaf morphology. Because a leaf is typically a dorsiventral structure, the epidermis of the abaxial surface is often different from that on the adaxial side. When stomata occur on both the adaxial (upper) and abaxial (lower) surface, the leaf is amphistomatic, on only the upper surface, epistomatic, and on only the lower surface, hypostomatic. The epidermis of leaves often bears trichomes that help to decrease water loss or glandular trichomes, which may help to discourage herbivores. The adaxial epidermis often has a thicker cuticle and fewer stomata than the abaxial side. On some leaves a hypodermis of thick-walled cells may be present immediately internal to the epidermis; this layer is believed to provide mechanical support for the leaf. figure 7.44 Section of Nymphaea leaf showing (palisade parenchyma) and SM (spongy mesophyll). Arrow indicates a scle-reid with simple pits on the wall (palisode parenchyma) (Extant). Bar = 200 pm. figure 7.45 Cross section of Pinus sp. leaf with two vascular bundles and resin canals (arrows) in cortex (Extant). Bar = 350 pm. intercellular spaces (FIG. 7.44). This tissue is ideally suited for the circulation of carbon dioxide and also provides a degree of flexibility to the leaf. Spongy mesophyll cells also contain chloroplasts, but they are generally not as densely packed as in palisade cells. The third component of a leaf is the vascular system or vein system. A transverse section of a leaf reveals many vascular bundles, each surrounded by a layer of cells termed a bundle sheath. Vascular bundles in a leaf are usually collateral, but bicollateral and concentric ones occur in some groups. 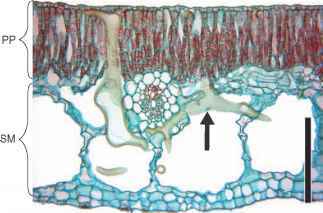 When collateral, the xylem is located toward the abaxial surface with the phloem below it; secondary tissues may be present as well. The veins may extend for several orders of branching (primary, secondary, etc. ), depending upon the particular leaf type or plant group. The leaves of gymnosperms (FIG. 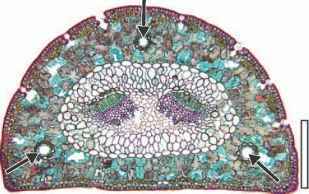 7.45) possess a slightly different tissue organization than that found in a typical angiosperm leaf. They often possess greater amounts of scler-enchyma and, in many instances, the vascular bundles are surrounded by a transfusion tissue composed of parenchyma and short tracheids. This tissue is believed to assist in conduction of materials between the vascular bundles and the mesophyll. Some leaves produced secondary vascular tissue, and stomata may be scattered on both surfaces. Many conifers, however, produce stomata in rows, termed stomatiferous bands. How many vascular bundles in a leaf? Where are the chlorenchyma cells found in the leaf? Which of the plants bears typical amphistomatic leaves?